There is something quite cheerful to poetry. It makes you remember things, takes you back in time. 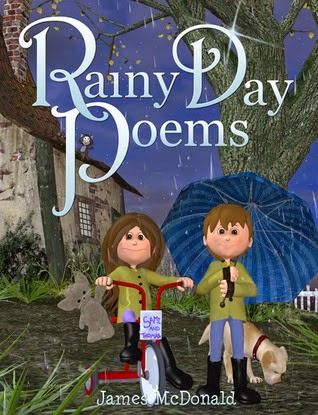 The book “Rainy Day Poems” by James McDonald is something I found while browsing the Kindle store for free e-books. I’m not sure what made me try it, but it is a collection of poems that is (and I don’t think there’s a more suited word for it) cute. It brought out the innocence of childhood. These are poems about a child dreaming of the future, a nightmare he has after seeing a spider etc. One that really felt nice was the one where the boy builds a sandcastle for his sister, but starts again when the sea washes the castle away. It’s sweet in showing the boy’s patience and limitless energy. And oh yes, the one about the cow and the farm got a big smile on my face. Just for an e.g. here’s part of a poem from the collection. I plan to live in space. My ship will take me far. And to a distant star. The illustrations for the poem are somewhat odd perhaps, but still cute (yes, I know that I told this word before). The rhyme is mostly that familiar ABCB beat. This is children’s poetry I guess. This is a book for the child’s imagination to grow, and one for the adult’s mind to take a break after a heavy literary fiction. Fun, light hearted poetry that feels like it is a perfect fit for children.